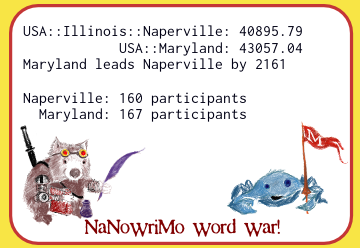 Maryland Blue Crabs - Congratulations on a Fantastic Finish to NaNoWriMo 2018! If you've hit 50K, don't forget to upload and validate! If you are still writing, you can continue to update your wordcount without validating again (that is just to confirm your win). Let's go Maryland Blue Crabs! A great way to recover from Thanksgiving is to get exercise. Like by writing or typing a lot of words! Feeling behind? No worries - there is plenty of time to catch up. Find every free moment to get in a few words. They add up! Over 10 million words, Maryland - keep it up! Vote, then reward yourself with lots of writing time! Today's Goal: 5001. You Can Do It! Are you ready for Halloween? Are you ready for NaNoWriMo? Are you attending a Kick-Off? Have you gotten your supplies (like coffee and chocolate, or green tea and whatever goes with green tea)? 22 days and counting...no pressure! Oh wow - it's already NaNo Prep time! Are you ready??? Don't forget to copy, paste, update, validate - BEFORE midnight! Good luck! C'mon Maryland Wrimos! You Can Do It! Write like your life (or your word count) depends on it! One More Day! Thanksgiving is over - now burn up those carbs by WRITING! Save early, save often, update your wordcount on the NaNo site as a reward for your hard work. Happy Half-Way Day! 25,000 is your goal - you owe it to yourself to get in a bunch of words, regardless of how many you have!!! 23,338 is tonight's goal. So close to the halfway point. Can you get in a few more words? Just a few??? Have you backed up your novel today? Avoid tragedy and save a copy of your file somewhere you can easily retrieve it! Look at those numbers! Awesome words! Awesome donations! Thank you, Maryland Wrimos!!!!!!!!!!!!!!!!! DOUBLE-UP DONATION DAY! Sat, 11/4/17. Get the $50 level prizes for donating $25! Get a cool NaNoWriMo pin! Can you double-up on your word goals? NaNo is shooting for $125,000 and 125,000,000 words. Join us!!! Are you writing yet??? Hope you saved some leftover Halloween candy - great treat carbs for the first week! If you are attending the Kick-Off in Columbia, please read punahougirl84's latest comment. We are still on - we'll just be a bit cozy LOL! Have you RSVP'd for a Kick-Off event? There are three threads below - please let us know if you are coming! 511 officially signed up for this year by announcing/creating their novel. 12 days and counting! You have NaNoMail! Possibly also email! Are you planning your novel, or are you "pantsing" (flying by the seat of your pants)? Have you updated your writing software? Tick Tock, Tick Tock... it's getting to be time for NaNoWriMo 2017! New merchandise is in the store and new ideas are in our brains. Librarians are setting up times and places to host write-ins through the Come Write In program. Your MLs are talking behind the scenes, ordering stickers, and getting ready. Can't wait to get started! TGIO (Thank Goodness It's Over) parties are on the schedule! If there is a thread, please RSVP in the thread. See you there! Have you made a donation to support NaNoWriMo? Can we make it to $7000? It's not too late to earn that golden halo! Many thanks to all who have donated. Now get back to your writing!!! Keep it up guys! There are 11 days left! How close are you to winning? Make you you know how to update your word count and make sure you know how to validate! I know you've all been working hard and writing all week! Don't forget to back up your story in case something unexpected happens. E-mail a copy to yourself, save it on an external disk, or put it on your Google Drive. However you do it, make sure you have a copy besides the one you're working on! Here's a tip: Try setting your alarm 30 minutes earlier so you can use that extra 30 minutes for an early word sprint. The only hard part is making yourself get up when the alarm goes off . . .
Word Padding Tip: Remember J. K. Rowling? Just THINK how many extra words she got by insisting her villain be called "He Who Must Not Be Named" - that's some serious word count! When it comes to character names, don't be boring - be like Rowling! Don't forget to update your word counts on this site! Right in the top toolbar on the site! TWO HOURS THIRTEEN MINUTES... BUT WHO'S COUNTING??? Are you going to a Kick-Off today? KICK OFF PARTIES are starting this weekend and continue through October. Please check out a thread and RSVP so we know who is joining us! Please make sure to check which area threads have been posted before starting a new one. That will make it easier to organize, meet up, plan, sob over coffee... and cheer each other on! Please join us in welcoming our newest ML, tonbird, to the wordy region Maryland! Happy October 1st! One month until NaNoWriMo 2016 starts. Are you ready? Are you prepping? Are you insane? Just kidding... we don't expect you to be ready yet. We'll be posting a new Welcome thread along with some others to get you started. Also, a big welcome to our new ML tonbird!!! Donations looking good - thank you so much! And if you haven't yet, there's still time to earn your golden halo! Don't forget to VALIDATE - when you break 50,000 words your bar turns green. To get your winner goodies and the Purple Bar of Glory, you must validate before midnight! Good Luck and Keep Writing! C'mon Maryland writers! Update your word counts! Break 40 million words! You Can Do It!! 2 more days! Write like there's no day after the day after tomorrow! Almost 30 Million Words in Maryland!!! Whose next update will put us over that number? Write! Update! WRITE!!! Save Early! Save Often! Update Your Wordcount! vix created a thread "Thoughts and Prayers from USA::Maryland" in the Europe :: France :: Paris regional forum - the ML from France::Paris has posted that they are at an all-night write-in near where all of the attacks occurred. They've decided to continue writing but invite any who wish to send messages to post in their forum. Please feel free to post a message in the thread. Approaching 20 MILLION words written in Maryland! Congratulations, writers, for your dedication and hard work. Hope your novels are going well. Plenty of time left in the month to reach 50K! Happy Friday! Gray, rainy days are perfect for sitting down with a nice hot mug of *insert favorite hot beverage here* and getting in some great wordcounts. Make it a Wordy Day! Have a buddy whose average wordcount has fallen off? Send them some encouragement via NaNoMail! Or feed them chocolate at a Write-In! Today, Day 9, is the day to break 15,000 words - dare yourself to do it. You deserve it! Day 6 is Break 10K Day! C'mon, you know you want to do it!!! End of Day 5 goal: 8335 words! You can do it! Check your NaNoMail! Pep talk from Diana Gabaldon! Check out our stats! Day 1, almost 2 million words written in Maryland. Over $4000 donated - WOOHOO! Happy NaNoWriMo! Look at Maryland Writers Go! Write On, Blue Crabs! Happy Halloween! Happy Last Day of NaNo Prep/Panic! Don't forget to set your clocks back so you can sleep an extra hour or get an extra hour to write! There's still time to cast your votes for our regional dares! We have over 100 events on the calendar. Thanks to all our wonderful Volunteer Write-In (and other events) Hosts!!! 5, 5 days and counting - ah ah ah! Don't forget to set up your novel in your profile (My NaNoWriMo - My Novels) so you get the fresh, empty gray bar where your wordcount will appear! Have you checked out the Calendar? Many events are being posted, including Kick-Offs! Will we see you sometime this November, or at an Oct Prep event? Ready for the site relaunch tomorrow? The forum will be squeaky clean, and you'll be able to set up your 2015 profile and novel info. Woohoo! The annual forum wipe is coming soon. Our tradition here is to start "area threads" and to check to see if one was created before setting one up. 2014's threads will be headed to the archive so you won't want to post to them for this year! A big Welcome to Michelle, aka Firewriter23, our newest Maryland Municipal Liaison! Welcome to September! New posts for the 2015 NaNoWriMo season will start showing up so stay tuned. Can't wait to see/meet everyone participating in Maryland come to the forum. There are two TGIO parties scheduled for tonight - it is not too late to post in the threads to sign up to attend. Hope to see you there! Now sign up for a TGIO party - you deserve it! Go, Maryland Writers, Go! Don't forget to VALIDATE before midnight, or you lose your chance for the Purple Bar of Glory and winner goodies! 232 winners and counting! 2 days left to write - who's going for it? Whatever you have by midnight tomorrow will be much more than you started with - Good Luck in your last push for greatness! Word Goal by End of Today: 40,000 and 8! How are you doing? Remember, this is about perseverance to achieve your goal. Write, Maryland Blue Crabs, Write! We're declaring today Volunteer Write-In Host Appreciation Day! Without your far-flung events all over the state, many Wrimos wouldn't get a chance to write like crazy with other like-minded writers. Thank You!!! 32 Winners so far who have Maryland as their Home Region! You can see status under the brown tab that says Members, under the USA::Maryland regional forum title above. 2340 Maryland Wrimos have entered word count. 9.3% of Maryland Wrimos have made a donation to support NaNoWriMo - Thank You!!! There is still plenty of time for the other 90.7% of Maryland to donate (hint!). Check out the Week Three Rally post on the Home page, which will take you to the NaNoMail it is referencing and a great pep talk by Brandon Sanderson! Wet, chilly Mondays - perfect for staying inside and writing, day or evening. Are you ready to write dangerously? Check out the new sticky thread below! Wow - Maryland has written the equivalent of about 413 novels as of 11/13. And donated $6200 so far! Positive noveling karma all around - keep it up! Need writing energy? Advice? A Pep Talk? You're in luck, because NaNo got amazing authors to send exactly that to you in your NaNoMail and/or email. Chuck Wendig, Veronica Roth, and now Tamora Pierce have sent use writing words of wisdom , and some pep for our writing. So if you haven't already read them, take a break, and do it. It can help! Love seeing those donations, word counts, and averages go up! Writing a novel isn't easy - if it was, everyone would do it. Remember, "One day I'll be a novelist" can end this month if you give yourself a chance and dedicate yourself to your novel. Build the writing habit. And if you had a slow start, who cares? Re-dedicate yourself this minute! Wow, up to $6000 donated! Thank you Maryland Wrimos! And there is still plenty of time to make a donation this month and earn that golden halo. Write-on! Double-Up Donation Day! Double your average wordcount! Donate $25 and get the $50-level donor thank you goodies! PLEASE! And thank you for supporting NaNoWriMo! Today is Break 10,000 words day!!! Can You Do It? Yes You CAN! Have you updated your Wordcount? Look at the top of this page where it says "words so far" and mouse over it for the box to enter your number, and the Update button. Keep writing, keep updating (it's a great little reward, to see your accomplishment graphed here). From @NaNoWriMo on Twitter: "The tech team is working on the glitches with the stats and “words written today.” In the mean time, we might have to (shudder) do math." So just keep writing and updating - this will get worked out! Remember, you can edit your words written each day in your profile stats. SO proud of Maryland! We have the most number of donors at 130, three ahead of Seattle, and at $4250 we have the second highest donation total (California:East Bay has the highest at $4810). I know we have more people who will donate, and hopefully we can get well into the 6K region, but I wanted to say Thank You to everyone who has done their part to support NNWM! According to our stats on the site, we have 1540 average word count per person entering word counts in their profile. I challenge EVERY participant to make sure they have updated their word counts AND to bug your writing buddies if THEY haven't updated yet! By the end of today everyone should have at least 3400 words. Will you get them? How about your writing buddies? Your MLs have faith in your ability to succeed. C'mon, post those word counts - we want to see you hitting your goals! 3 days and counting... Have you stocked up your groceries? Treats? Beverages? Getting laundry done in advance? Are your writing materials all in order? Computer files created? Figured out how you will back up your work? Drinking water and getting sleep now? Welcome Everyone Who is "Finally" Getting Serious! In 10 DAYS, we'll be writing!!! Are you ready??? Kick Offs are on the calendar! Oct 25th (hosted by vix), Oct 31st (hosted by nursechriisy09), and Nov 1st (hosted by punahougirl84)! Please RSVP in the correct thread below! Have you updated your profile for 2014? Have you figured out what you are doing? Have you posted in the Welcome thread? Have you volunteered to host a write-in, or RSVP'd for a Kick-Off? Have you found or started your area thread? Have you DONATED??? Watching out for lovely halos of helpfulness! OCTOBER!!! Are you prepping? Are you ready? Please check the Pre-Shutdown thread to say hi or ask a question, email an ML, find us on FB too at Maryland NaNo, and get ready for a forum reset around Friday! 2609 writers who have Maryland as their Home Region, and who were actively entering word count, wrote a total of 50,548,726 words. Our average was 19,374.75 per writer. 580 Finished and Validated their win! 568 out of 2610 - c'mon, you've about 10 minutes left to Validate! Do It! 3.5 hours - fix some tea and WRITE! 427 winners Validated - 16% of our region! Keep Writing, keep Validating, keep Winning! 388 winners - keep updating, get Validated! 305 winners so far, about 12%, and hoping many more validate before midnight Nov 30! ONE DAY! Finish, Save, Back-Up, Validate!!! Go Maryland Writers, Go! Seven days left! Seven glorious days in which to get a ton of words! Don't leave your novel hanging - give it some love and pelt it with words until it cries Uncle! We have 29 winners so far, 16 of whom are participating in the Word War with the Lushguins! Keep Writing! Did you read Lev Grossman's Pep Talk? Awesome! And you have a new one from Marie Lu in your inbox! In to Week 4 +2! Yes, this is a "long" week - how are you going to get your words in? WRITE! UPDATE YOUR WORD COUNT! WRITE SOME MORE! November 15th is Half-Way Day! Will you make it to 25K? How close can you get? Can you beat it? GO FOR IT! Hey, it's Friday night, make a Writing Date Night with friends and get those words in. We are getting the feeling that Marylanders are taking their committment seriously and making time to write. Impressive numbers - keep going. You WANT that purple bar of victory, you KNOW it! You have new NaNoMail! Check out the guide to week 2, and a new pep talk, and get help/motivation/inspiration... just not a chance to procrastinate! According to the word count scoreboard, Maryland writers have an average of 7524 words per person. All with modest word counts at that number or less, you are challenged to hit 9000 by tomorrow! Go, write, your story needs you! There are TEN Write-Ins on our calendar - hope the hosts are showing up and writers are taking advantage of the chance to get OUT of the house and do a Write-IN! Happy Marathon Writing and Donation Day! We'll use #MarylandNaNo to report on our crazy writing day this Saturday, to celebrate our donations, to cheer each other on! It's time to check your NaNo Mail! Week #1 pep talk has been sent out from your ML's. :-) It's a pleasure ML-ing such an awesome group of Wrimos. I'm delighted to have met as many happy writers as I have so far over the past 7 days. Keep up the good work, everybody! 8,487,497 words so far! Fantastic dedication to your novels, Maryland! Maryland Day 1: 2,334,904 words! Want to be added to the Maryland NaNo Facebook page? Message one of our MLs with your info, including the name you use on this forum. We've had several requests from spammers and try to screen approvals. Have you donated yet? If not, here's a link! NaNoWriMo Needs YOU! Donate! Today is the today, your last opportunity to vote for our DARE! Make your opinion known before midnight tonight. Wow! We have several threads on page 2 of our forum - don't miss out and check on them! Glad to see our area threads thriving and people prepping for Nov 1. We Can Do This! Every ML has posted a thread for a Kick-Off event! If you plan to attend, please post an RSVP in the thread - thanks! It's time to check your NaNo mail! I've just sent out a welcome e-mail. Keep an eye out for more e-mails throughout the month, pep talks during November, and for information on what to do after NaNoWriMo is over. WELCOME! PLEASE READ! Before starting a new area thread, in which local Wrimos discuss where and when you'd like to have write-ins, and who will host, please make sure to check the other thread titles to avoid duplicate threads. Thank you - let's get planning! Attention Campers! There will be some write-ins in April. Check for threads below, and you can also check the Maryland NaNo group on Facebook! Congratulations Maryland Wrimos! We wrote 48,909,424 words and donated $6270 (when the most recent donation gets added to the current number of $6210). Thank you for your generous donations! We hope everyone learned something important whether you finished or not. Congratulations to everyone who passed the 50K line! If you did not, you at least have a novel underway that you can work on in the coming months. See you next year - we are already planning some great things for you! Two more hours - WRITE WRITE WRITE! Maryland Writers are AMAZING! You can do it! GO GO GO! Donations up to $6210 - thank you! $6150!!! Thank you to whoever contributed another $100 since our last FB post - NaNo needed this and Maryland pulled through! Obviously hoping that number goes up even more but we are SO grateful to the person or persons who stepped up today to make that happen! C'mon Maryland Writers! Almost 46 million words and donations have reached $6005 - thank you! We are getting there - UPDATE, DONATE, so we can all CELEBRATE! Up to 208 donors and $6065 in donations! Only $5 more to go to tie last year's number - we are SO going to beat that number. THANK YOU MARYLAND! Can't wait to see where we end up. $395 more from 3 donors - incredible. All our donors are NaNoAngels! Word count is past 42 million - last year we almost made 44 million - hope we get there! After the last broadcast email several new people joined the Maryland NaNo FB group, and donations got another push to $5455! We've still a ways to go to beat last year's number of $6070 but a huge thank you to the 193 who have made contributions! Donations jumped to $5075 - 2nd place! THANK YOU! We have 177 people out of 2541 active-homed writers that have donated. We are in second place for overall word count. We are 291st place for average word count. Keep up the good work! Happy Donation Day! If you have not yet earned your halo, what are you waiting for? You love NaNo, you want it to keep going, you support young people writing, right? Please, if you've been waiting to donate, now is the time! And a HUGE thank you to those who have answered the call - we went from $4090 yesterday to $4510 and jumped into 2nd place in the Donation Derby! We have 2995 active writers and I hope we get a great donation rate! At the moment, the official wordcount widgets don't match the Word Count Scoreboard. Don't worry about it - just keep writing YOUR words so you finish YOUR novel! We are the first region in the USA to cross the 10 Million Word line! And another $25 came in in donations. Thank you, Maryland! UPDATE YOUR WORD COUNT (see box at the top of the page)! We hope your first day went well! Don't forget to update your Word Count (see the box at the top right of this page?). The site always slows down as OLL adds functionality (word count scoreboard, etc.) and as thousands of writers sign in and start updating word counts. Have a little patience and the site will get back to normal soon! Meanwhile, keep writing! Happy NaNoWriMo Eve! Hopefully the trick or treating is finished and you are in the last stages of getting ready to write. Some will start at midnight, some will get sleep first, but we all, finally, after all the waiting and planning and stressing, get to WRITE!!! Good Luck! One Hurricane Sandy thread has been stickied. We will use it for all storm-related questions/issues/ideas. Please make sure you are prepared to be safe, first and foremost. After that, be sure you are ready to write without electricity, or have alternate places to go that will have power. We Can Do This! Our 2nd Dare: Use the names of the 5 British bomb vessels of the Battle of Baltimore -- Terror, Volcano, Meteor, Devastation, and Aetna, in your novel. Bonus points for using the name of the British rocket vessel: Erebus. Voting ends today for Dare 2 - hurry and VOTE! Final RSVPs being accepted for Kick-offs - be sure to read the directions and post soon. Have you outlined yet? Donated? Bought treats? Gone crazy with excitement such that your family and friends are already looking at you with wild, concerned eyes? Good! The Calendar has been updated - check out all the events, with more to come! Don't forget to RSVP for a Kick-Off Party/info session. Vote for Dare 2 - deadline Oct 25th! Dare 2 is posted - vote now for your favorite (or the one least likely to twist you into a pretzel trying to work it in to your novel!). RSVP for a KICK-OFF PARTY! Look for the threads at the top of the forum. We have threads on two pages now - if you are looking for a thread for writers in your area, don't forget to check page two! The MD NaNo calendar is starting to fill up -- but there are still plenty of areas that currently offer no writing opportunities. Consider hosting a write-in! Are you ready for some writing? Time to plan! NaNoWriMo was given a $50,000 grant by Chase Community Giving! Thanks for the clicks! Soon the website will reboot for NaNoWriMo 2012. Are you planning? Are you excited? Be sure to visit the Donations/Store section of the website: Look for new NaNo goodies and make that all-important donation! And check back here often. We'll soon be posting new threads with Kick-off and Write-in dates! December 1st: We Won BOTH the Lushguin and Naperville Challenges! Our final regional total is 52,633,236, with 1790 writers Homed to Maryland, and a donation total of $5975! CONGRATULATIONS! We surpassed a gracious Naperville by 2161 words per participant, and the ever amazing Lushguins by 4046.909 words per participant! Considering that with 1835 people last year we wrote 38,844,212, I'd say the challenges helped push more people to finish their novels than ever before. We averaged 29,404 words per participant. Time to Celebrate - TGIO!!! Day 30 - I hope everyone is ready to validate but if you're not, remember that you've got until 11:59:59 tonight! I had a 6K word day yesterday and you can too, or however many words you need. The key is staying optimistic! You can do it, but make sure you do it for yourself. Sometimes you can be your own best motivation and advocate, so let yourself shine! Day 28 - Don't forget to RSVP for a TGIO party in the proper thread. Links to the threads are in our Links section. Ok, done? Now go write some more in your novel!!! Day 27 - Catch up! The leftovers have been eaten, the visitors are headed out (or you are headed home). Time to get back to serious writing. Many of us aren't done - even those with purple bars of validation victory are still writing to FINISH the story. So let's get going - the Ravens won so we don't even have to worry about cheering for them today - WRITE NOW!!! Day 24 - Happy Thanksgiving! Enjoy your day however you are spending it. Remember that typing/writing is great exercise for your fingers after a feast. We are thankful to have you writing, donating, participating, supporting, and just being! Day 23: PLEASE DONATE! National Novel Writing Month is a project of the Office of Letters and Light, a 501(c)3 nonprofit organization based in Oakland, California. All donations made to National Novel Writing Month---in the form of cash and in-kind donations of helicopters and lavish chocolate fountains---are tax-deductible. Currently we have 1752 writers with Maryland as their Home Region who have donated $4675. Thank You! That makes us 4th in donations - can we get to first place??? Day 21 - Have you updated your word count on this site yet? Just go to that little blue box at the top of this page and to the right of your name and post it! There is also a Stats tab in your profile where you can see your progress, and all kinds of cool numbers. I love seeing my bars push past the graph! Eleven people who posted in the Welcome thread have word counts of "zero" - but I bet you have words - let us know you are ok and writing by posting your counts!!! Day 20 - GO RAVENS! GO BLUE CRABS! Everyone do your best to get some words in today - MAKE the time. DVR/Tivo the show. Use commercials during the football game. Do mini sprints for 100 words or 200 words - whatever works. BELIEVE! Day 19: Night of Writing Dangerously ONLINE! Saturday, November 19, 1011, from 8pm-Midnight. The chatroom is MD NaNo NOWD 2011 - we'll do online word wars where every writer in Maryland can participate! The chatroom is set up so you can make sure you can get in - I set it to People Near Me but could not restrict it to friends or do it by invitation only since this is new for us but hopefully this will work. Day 18 - Did you write? Day 17 - Now would be a good time to ramp up your words per day in anticipation of the holiday next week! Don't forget to use all five senses when writing descriptions. Introduce characters who go by their first and middle names all the time. Hyphens and apostrophes are your enemies. When in doubt, drop in some ninjas, throw a dinner party with an exhaustive menu, or have a family reunion in your novel with a LOT of new characters showing up. Who must all be described... you get the idea! Day 16 - Happy Donation Day! Like NaNo? Want to keep it happening? Need some good noveling karma? Please consider making a donation to NaNoWriMo (see the brown tab above for Donations/Store). Earn that halo - and we thank you for your support! Day 15 - Happy Half-Way Day! 25,000 words are your goal for the day. Congrats to all who have achieved it, and tons of wordy thoughts going out to any who aren't there yet. We've had some great pep-talks sent to us - let them inspire you to get those words in. Don't let anything stand in your way - order out, get others to run the laundry, hide if you must to get some writing time. You Can Do This! Day 14 - Happy Monday! Have you updated your word count here? Have you checked out the cool stats tab in your profile? I find them to be very motivating. Our challenge with the Lushguins is going well, people are finding creative ways to get in their dares, and plenty of help can be had here or in our FB group if you are stuck. Don't let that inner editor sneak back in your home - lock it out so you can write write write! Day 13 - How are you doing? Going well? Going slow? Don't worry - you have plenty of time and no reason to think you'll blow a big game! If you get stuck, figure out where you are and where you are going. Think about your character's motivation - what do they want and why do they want it and how are they going about getting it? Then mess it up - throw obstacles in their way - time for some conflict!!! Day 12 - A beautiful day for some word sprints! Every thousand words give yourself a reward. Some sunlight, a Halloween treat, convince a loved one to give you a hand massage. Whatever it takes. Get ahead now, or catch up - do what it takes so you can enjoy the Ravens game tomorrow! Day 11 - A special day, 11/11/11. Hope all is going well for all our writers. ML vix/Vickie is hosting a Write-In at Wegman's in Lanham from noon to 3pm on Saturday, 11/12 - look for a seating area with a NaNo table tent! New Write-Ins: Brunswick and College Park IKEA! Day 10 - A good day to hit about 17,000 words! And even more write-ins are being scheduled. Could it be that people are learning about the thousands of words we are writing while surrounded by others frantically typing/writing? We've made believers out of many! Day 8 - Get Week 2 going with a bang! Day 9 - Check calendar for new write-ins. There is now a Write-In at La Madeleine in Bethesda, hosted by the DC MLs! 7:30pm-ish. Update your Word Count - we have widgets with our avatars now! Day 7 - Did you back up your novel? Save early, save often, and save in more than one place! Also, new write-ins have been posted - check the calendar, and check the forum for impromptu write-ins too. Day 6 - Fall Back! Not in your word count, of course, but on your clock. Are you using your extra hour for writing? Or something silly like sleep? However you use it, use it wisely - think of it as a gift making November that much longer than any other 30 day month. Day 5 - Last chance to sign up for our Regional Word War with the Texas Lushguins! We need people who are in it all the way, who are going for massive word counts, who will help us have the highest average word count! So if you are pushing beyond 50K, if you know you will stay the course, this challenge will help motivate you AND will help us! This is about the highest word count per person, NOT our collective word count. Someone who writes 7000 words and stops for the month would bring our average down - but you could still join and if you can't finish, drop out by the date indicated. Carol needs confirmation emails that people have read the rules and understands the challenge and are definitely in for the WIN! But if you were confused, no worries, we don't have to finalize the list until tonight, so feel free to drop out or enter - we love those big numbers! Go Team Blue Crabs! Day 4 - Don't forget to stretch - wiggle your fingers, roll your shoulders, get up and move - sitting for a couple hours writing can be hard on your body, and we are still in the beginning of the month. Your wrists need a break. Also, when you sit to write, try to support your back by tightening your core (hold in your tummy) - better posture will prevent later pain. Ok, go write more now! Friendly write-in space is avaiable everywhere. I'm here at Ukazoo Books in Towson and they have signs for NaNoWriMo everywhere. They've offered their meeting room for free at any time for NaNo-ers. They've got wi-fi for free, complimentary tea and coffee, and power outlets. They've even got a power strip in the middle of the table for easy access! Day 3 - Write-ins are great ways to get in a high word count, especially due to word wars. But if you can't make it to one, or there isn't one near by, consider an online word war. Chat with a writing buddy, set a timer, write like the wind... regardless of who has the higher count after 10 or 15 minutes, you BOTH win! Day 2 will be bright and beautiful so be sure to get outside for a breath of fresh air and some sun, maybe as a break from writing? Honest, a few minutes will refresh you and you'll write even more! ARE YOU WRITING??? Day 1 - Go Go Go! Forgot to load up on chocolate before midnight? Take care in how you raid your kids' trick-or-treat bags - they WILL notice! Almost time - less than an hour... BOO! Our regional dare vote ended in a tie! Get ready to use both calico cat and black-eyed Susan in your novel. Get ready to lock up your Inner Editors - there are just hours left until you can start writing the best/first NaNovel of your life. Are you ready??? Sorry for the delay in choosing the regional dare. Go to the "Dare: Let's vote this out!" thread below to help us decide. Please post only one choice and do so even if you have expressed a preference in the dare suggestion thread..
"Writing Buddies" is back - so you can add friends and track them now! Our former lists will be ported from the old system over the weekend. This is wonderful because, as you know, misery, or rather, literary abandon, loves company! We might be getting Writing Buddies back soon - keep checking! The Kick-Off Parties in Baltimore and Denton are set up and on the calendar - see links to the threads in our Links section so you can RSVP! The Kick-Off Party in Gaithersburg/Rockville is also coming up - thanks to all who have posted their RSVP! Thanks to everyone who attended the Kick-Off in Columbia! I hope you found it helpful and fun, that you got to meet fellow Wrimos, and that you discovered confidence in your ability to complete a 50K novel in 30 days. I could not give you infinite monkeys to produce your own version of Shakespeare's works but I do hope the one I gave you helps you get one step closer to noveling greatness! Eight days until it gets real, so get outlining (or not!) and get some rest. We can sleep in December! Don't forget we now have two pages of threads - your area thread might be on Page 2 - if you are looking for your area, scroll through all the threads - you might find it! ML vix is busy getting write-ins on the calendar, and if there isn't one in your area, please feel free to host one! All the info you need is in the sticky about write-ins and hosting! Want a great way to ensure you'll be driven to achieve 50K or more? Join our Word War Challenge with the Lushguins! Write to defend the pride of your region - plus it is a great kick in the... keyboard! Click the link or the thread for it and follow the directions. To join in , you MUST email our coordinator tidewaterbound (Carol) whose info is in the thread. Hope to get a bunch of challengers soon! We now have a Facebook page (thank you ML Chrissy for starting it up!). Check the link under Links (look to the right and under Meet Your MLs and About Us sections of this regional header) to find it. After a minor blip on my part (links are evil! ), I'm back to share and promote the Google Map created for the region. Attached are locations for write-ins and the Kick Off Parties. Here you go! Smaller, better link for the Google Map! Soon to be posted with synchronized events from the Google Calendar, the Facebook page. Welcome Maryland Writers to NaNoWriMo 2011! These are a few of my noveling things! In case you missed it, the new NaNoWriMo site has been launched and Maryland writers, rookies and returnees, are flocking to our forum and getting ready to write a novel. We know when the leaves are falling and Ray Rice is scoring that it’s time to get going on our writing! 1)	Sign in to NaNoWriMo, update your profile with the years you’ve participated in NaNo and the years you’ve won NaNo, and any other sections you wish to fill in. Upload a new avatar! A few options like Writing Buddies are still being worked on by the HQ Tech Team but almost everything you need is ready. 2)	Come post an introduction on the Welcome thread in our forum! 3)	Post a suggestion for this year’s Maryland Dare. An official voting thread will go up to make the final decision for what all Marylander Wrimos will attempt to include in their novels. 4)	Sign up for our traditional Word War Challenge vs. the Lushguins! There’s nothing like a deadline AND a challenge to get those words out of your brain and into your computer/iPad/ smartphone/notebook/clay tablet. 5)	RSVP for a Kick-Off Party! One will be in Columbia on Sunday, October 23 from 11am-1pm, another will be in Shady Grove on Saturday, October 29 from 11:30am-1:30pm, and a third will be in Baltimore on Sunday, October 30 from 12pm-3pm. Please come to our forum to RSVP (post in the thread for the party you plan to attend) so your MLs can plan appropriately! 6)	Find a thread for your area and see who is writing nearby. If there is no thread for your area, feel free to start one. 7)	Organize and host a Write-In! Ok, not everyone will be a host, but we Marylanders are very good at getting our novels written in great part due to attendance at write-ins hosted by our wonderful volunteers. You can discuss times and places in your area thread, then the host can read directions and post a calendar request in our write-in and calendar request thread. 8)	DONATE! While participating in NaNoWriMo is free, everything that makes it possible is not. Please, Maryland writers, we are asking you to make a donation this year. Earn that halo and outstanding noveling karma by making even a minimum donation. You can find the link for donations in the same tab on the site for the store. 9)	Merchandise purchases also help fund NaNo and there are some wonderful new items including this year’s t-shirt (available in long sleeves!) with Baty-isms that will help you all month. There are awesome new keychains, and even a polo shirt and messenger bag! Display your NaNo pride (not insanity, pride!) with cool new gear. 10)	Finally, and most importantly, get ready to write 50K in 30 days. Some of you will already have started with ideas, research, outlines, plots, characters, setting, maps… others might have decided to just wing it. If you need help, there are several forums set up with tons of ideas if you are stuck. Your MLs are also wonderful resources for tips and tricks, which they’ll share at their kick-off parties (hint!). This year we have more Come Write In partners than ever! Please patronize these locations who have opened their doors and invited us to write with them. Are there any writers who live on the Eastern Shore of Maryland?
. :: Catonsville Library Write-Ins ::.